First of all I apologize for the site being down Thursday, I am working to move it to a more hospitable host so please bear with me for the next couple of weeks and hopefully when I am done it will be faster and more reliable. 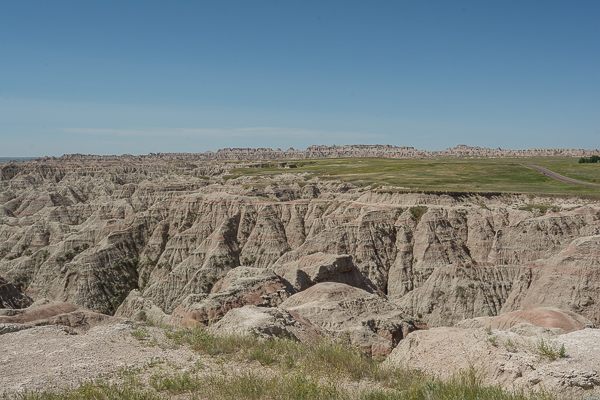 Storm and I have visited Badlands National Park several times, but we always enjoy this park and were glad to get to share it with our family. We were lucky to catch it on a cool day (84 degrees – no humidity) so a few short hikes and a windy picnic at the visitor center were doable. This time we took the Sage Creek Rim (dirt) road on the way out of the park and discovered the wildlife area. We passed by Roberts Prairie Dog town which was filled with Priarie Dogs chirping and watching us. We also saw antelope and Bison on this road. We had never been able to take this road before because we were on the motorcycles on previous visits and this is a long dusty road not very suitable for street bikes.